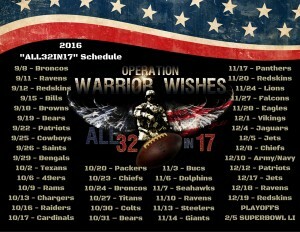 For the 5th straight year we completed our “All32in17” mission by making Warrior Wishes come true at 43 NFL games throughout the 2016 regular season! 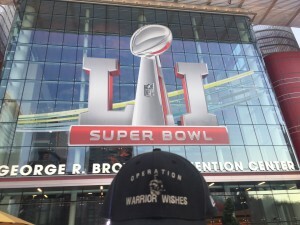 With the regular season behind us, it was time to focus on making wishes come true at one playoff game each week leading up to the final game of the 2016 mission at the Super Bowl in Houston! One of the most important pieces of our mission is to provide an experience at each game. For us, it’s more than just a game. We want to personally thank each warrior for their service & sacrifices. We do our best to provide each of them with a stress free day filled with memories. That’s why my dad is typically on the road to host each warrior even though he doesn’t always go to the games with them, especially when tickets are expensive. 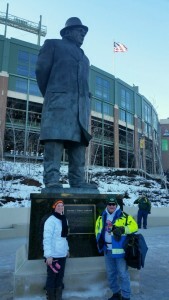 We decided to make wishes come true during Wild Card Weekend in Green Bay. 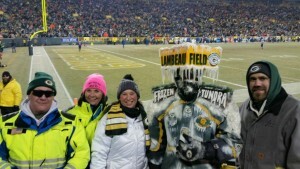 We have received a lot of nominations for Packers games over the years & are still working to make every wish come true. 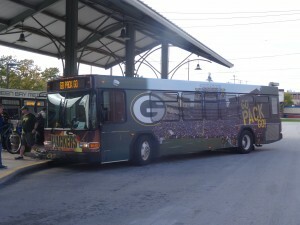 Plus Green Bay is only a 3 hour bus ride away. Unfortunately, inclement weather prevented my dad from traveling to Green Bay for the game. Thankfully, our friends, the Tompa’s, stepped in to host the Warriors! 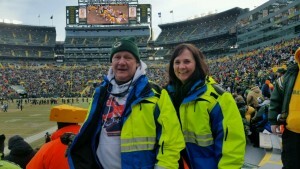 Unbeknownst to each other, Jeff Mumm nominated his wife Army SPC Alissa Mumm for the Packers game. Coincidentally, Alissa had nominated her dad for a Packers game! 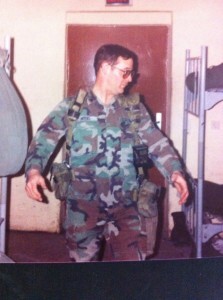 Her father, Army MSG Curt Myers proudly served our country for 37 years! 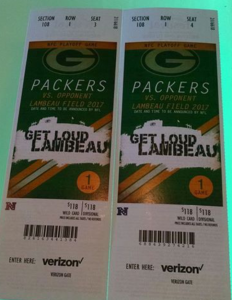 My dad pulled out his “radio show” trivia contest to surprise them with FRONT ROW tickets to the playoff game! 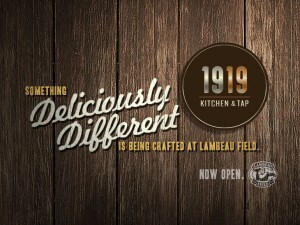 The Packers won their final 6 games and beat the Detroit Lions last week to win their division. They were one of the hottest teams to enter the 2016 playoffs. The Giants had a playoff spot locked up and rested a majority of their starters during their final game of the regular season. Aaron Rodgers & the Packers continued to stay hot in the freezing cold temperatures. 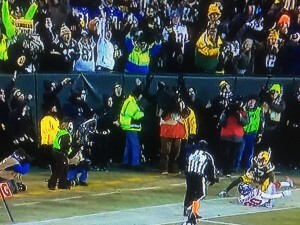 Randall Cobb scored 3 times in the game and the Packers went on to win by the score of 38-13! My dad & I watched the game from home and actually saw the Warriors celebrating a couple of times as the Packers scored in their end zone right in front of them! My dad reached out to the Warriors after the game to make sure that everything went well & to thank them for their service again. they told him how much fun it was to spend that special father-daughter time together – and especially at a Packers playoff victory. We are extremely proud to have provided this opportunity for them and would like to THANK them both for their service & sacrifices to our country! 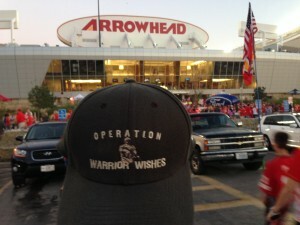 We will be back in action next week making wishes come true at the Chiefs – Steelers game in Kansas City! Stay tuned for more details! My name is Curt J. Myers and I am a retired Army Veteran, having served 37 years and 7 months in the Army – Active duty, National Guard, and Reserves. In my time span, I have held three military occupational skills (MOS’s), have lived all over the United States and abroad. My military career began in 1973 when I went to basic training at Ft. Jackson in South Carolina. I have held several positions and a multitude of jobs while serving in the military. In 1991, I was sent to Iraq during Operation Desert Storm, where I obtained the bronze star. 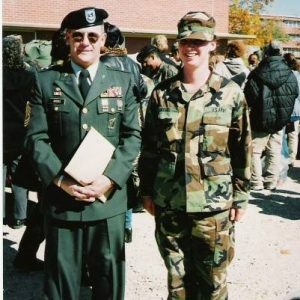 I have been honored with several different awards and opportunities obtained in my years of service with the Army, with one of my highlights being my daughters entrance into the Army as well during my time as a recruiter. When I left active duty and joined the reserves, I held employment at Ft. McCoy as a military technician with the 88th Regional Support Command. I finally retired my military and military technician service July 2012. Being retired now, I still have anything but free time. I currently live in Hurley, Wisconsin with my wife Terry and my golden retriever Maddie. We are the owners and operators of Trails and Tales Outdoor Adventures, LLC in which we provided guided rides and services through miles of Iron County ATV and snowmobile trails. The travel bug that I caught in the military has not left and my wife and I enjoy taking our camper out and hitting the open road to explore old and new places alike. We have four grandchildren, Parker, Keaton, Sandra, and Hailey, whom we spending every moment possible with. I have also been laboriously working a B-52 Crash Site memorial in Hurley, Wisconsin. I strive every day to remember the fallen, the missing, and those who serve today. I am also an avid supporter of the Green Bay Packers and the Chicago Cubs, a love of sports I passed on to my daughters as well and they are now passing on to their children. I also enjoy hunting and fishing as well being able to teach my grandchildren the skills to be successful sportsmen in the future. My name is Alissa Mumm and I am currently from Platteville, Wisconsin. I grew up as one of two children to a father who was active duty. We grew up all over, Wisconsin, Texas, and Germany, experiences many probably will never have. Though in some sense, moving so much was hard on us, I followed in my father’s footsteps and at the age of 17, and enlisted into the Army Reserves as a Medical Laboratory Technician. I was originally assigned to the 114th Combat Support Hospital out of Madison, Wisconsin and later, the 452nd Combat Support Hospital in Milwaukee, Wisconsin. I was in basic training on 9/11, a day which I consider to be a pivotal turning point on my desire to serve this country, despite not really seeing any footage until 3 years following that day. I served with others from New York and waited with them as they anxiously tried to reach out to family and friends. I completed basic at Ft. Leonardwood, Missouri and left right away for advanced individual training phase one at Ft. Sam Houston, Texas and phase two at Ft. Gordon, Georgia. I returned home in 2003, where I started school at UW-Platteville. I went on to graduate with my Bachelor’s and later, my Masters Degree, from UW-Platteville, both degrees in Criminal Justice. Following my completion of my Bachelors Degree, I started working for the VA Hospital in Madison, WI and my passion and devotion to our service members grew even stronger. While enrolled in a leadership development class, I discovered a position designed to work with the Veterans who were dealing with the “wrong side” of the criminal justice system. This spurred my to start my Masters degree, which cumulated in a thesis paper, titled “The invisible wounds of war: recommendations for recognizing and assisting veterans in the criminal justice system”. Though, as passionate as I am about working for our Veterans, I am currently working for the State of Wisconsin Public Defender’s office and, perhaps fortunately, only a very minute fraction of clients served are Veterans, though I still hope one day to find a job which will allow me to work for Veterans in whatever capacity I can, a passion inspired by my own service and by the passion and commitment I see my mom and dad give every day to Veterans. Outside of all of this, I love spending time with my husband Jeff, our three-year-old Sandra, and our one-year-old Hailey. We love the outdoors, hunting, fishing, atv’ing, and spending time together and of course, cheering on the Green and Gold!! GO PACK GO!! !